Judge A.B. 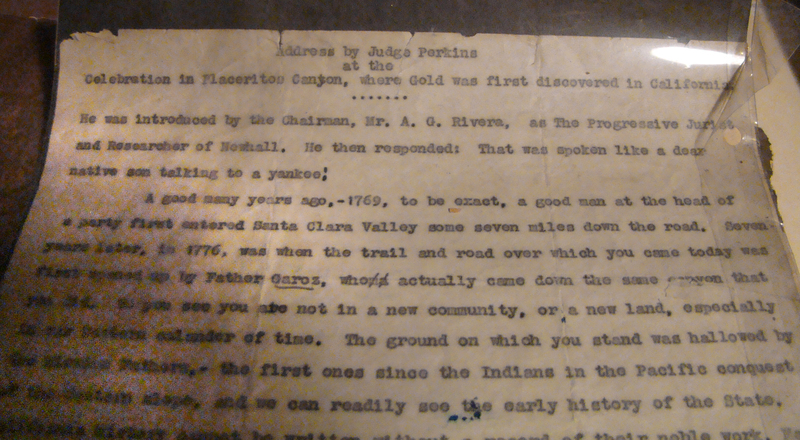 Perkins' Speech at Oak of the Golden Dream Dedication. A good many years ago, —1769, to be exact, a good man at the head of a party first entered Santa Clara Valley some seven miles down the road. 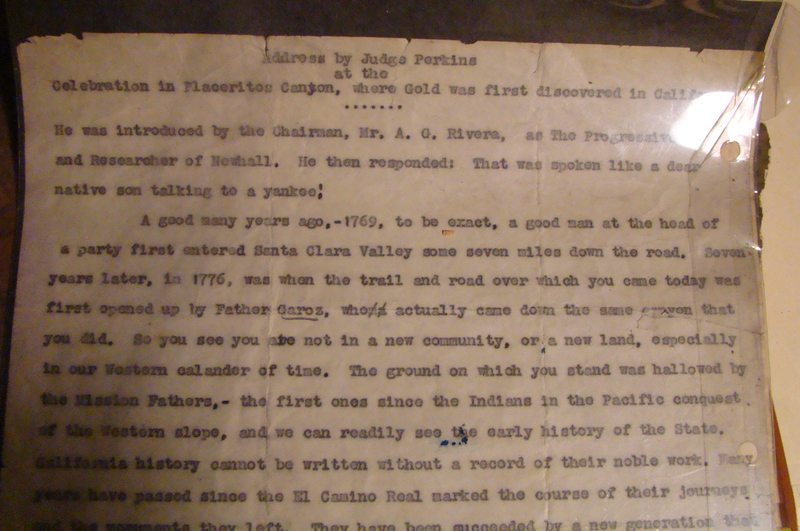 Seven years later, in 1776, was when the trail and road over which you came today was first opened up by Father Garoz [sic: s/b Garces], who actually came down the same canyon that you did. So you see you are not in a new community, or a new land, especially in our Western calander [sic] of time. 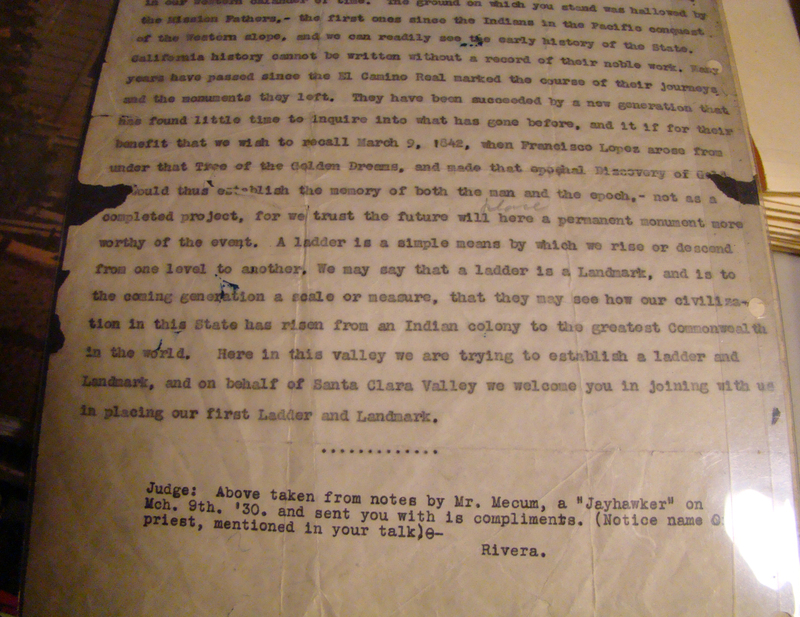 The ground on which you stand was hallowed by the Mission Fathers, — the first ones since the Indians in the Pacific conquest of the Western slope, and we can readily see the early history of the State. California history cannot be written without a record of their noble work. Many years have passed since the El Camino Real marked the course of their journeys and the monuments they left. 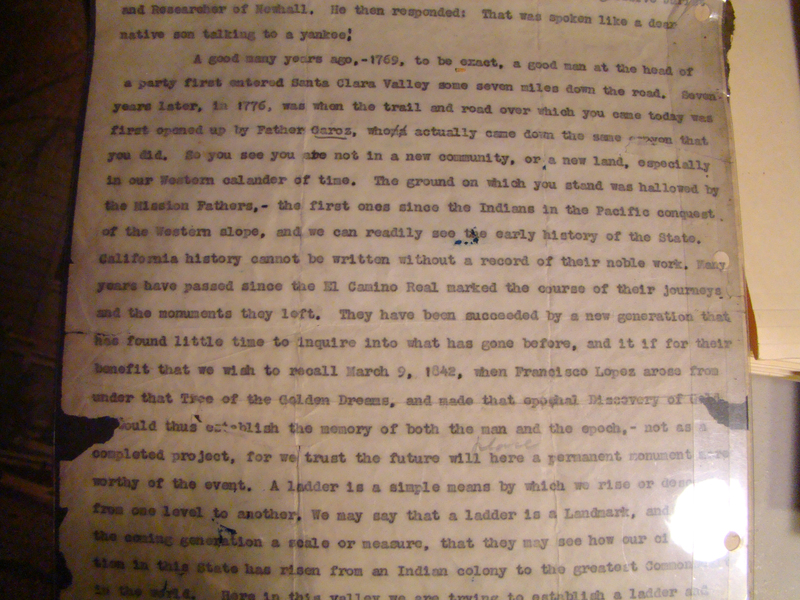 They have been succeeded by a new generation that has found little time to inquire into what has gone before, and it if [sic] for their benefit that we wish to recall March 9, 1842, when Francisco Lopez arose from under that Tree of the Golden Dreams, and made that epochal Discovery of Gold. [He?] would thus establish the memory of both the man and the epoch, — not as a completed project, for we trust the future will place here a permanent monument more worthy of the event. A ladder is a simple means by which we rise or descend from one level to another. We may say that a ladder is a Landmark, and is to the coming generation a scale or measure, that they may see how our civilization in this State has risen from an Indian colony to the greatest Commonwealth in the world. Here in this valley we are trying to establish a ladder and Landmark, and on behalf of Santa Clara Valley we welcome you in joining with us in placing our first Ladder and Landmark. AP9011a-d: 19200 dpi jpegs from digital images by Leon Worden, 3-2-2008, of original document in A.B. Perkins private collection.